The first generation of Cyclopes were early characters in Greek mythology, predating Zeus and the other Olympian gods, for this first generation were the offspring of the primordial deities Ouranos (Sky) and Gaia (Earth). These Cyclopes would number three, and were named as the three brothers, Arges, Brontes and Steropes. The parentage of Ouranos and Gaia, also made the Cyclopes brothers to the three Hecatonchires and the 12 Titans. At the time of the birth of these Cyclopes, Ouranos was the supreme deity of the cosmos, but he was insecure in his position; and worried by the strength of the Cyclopes, Ouranos would imprison his own sons within Tartarus. The Hecatonchires would follow the Cyclopes into imprisonment, for if anything, they were even stronger than their brothers. The imprisonment of the Cyclopes and the Hecatonchires would see Gaia conspire with the Titans to overthrow their father, and indeed Cronus would usurp Ouranos, after castrating him. Cronus though was no more secure as supreme deity than Ouranos had been, and he refused to release the Cyclopes from Tartarus; and indeed added an extra prison guard to Tartarus, when the dragon Kampe was relocated there. Freedom would only come a generation later when Zeus rose up against his father Cronus, just as Cronus had done before him. Zeus was advised that in order that he might be victorious in the Titanomachy he must release the Cyclopes and the Hecatonchires from their imprisonment. Thus Zeus descended into dark recess that was Tartarus, killed Kampe, and released his “uncles”. The Hecatonchires would fight in the battles of the Titanomachy alongside Zeus and his allies, but arguably the role of the Cyclopes was even more important, for the Cyclopes set to work crafting weapons. The Cyclopes had spent their many years of imprisonment within Tartarus honing their blacksmithing skills, and soon the most powerful weapons ever crafted were being used by Zeus and his allies. It was the Cyclopes who crafted the thunderbolts used to deadly effect by Zeus throughout Greek mythology. The Cyclopes also manufactured the Hades’ helmet of darkness that made the wearer invisible, and also Poseidon’s trident that could cause earthquakes. After the Titanomachy, the Cyclopes were also credited with having made the bow and arrows of moonlight used by Artemis, and also Apollo’s bow and arrows of sunlight. The creation of the helmet of darkness is often said to be the reason for Zeus’ victory during the Titanomachy, for Hades would don the helmet, and slip unnoticed into the camp of the Titans, destroying the armaments of the Titans. Zeus recognised the aide that the Cyclopes had given him, and Arges, Brontes and Steropes were invited to live upon Mount Olympus. There, the Cyclopes, would go to work in the workshop of Hephaestus, crafting further weapons, trinkets, and also the gates of Mount Olympus. 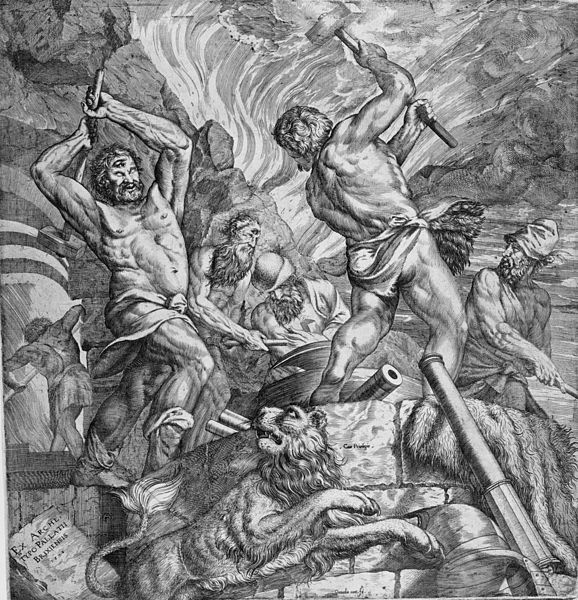 Hephaestus was said to have had multiple forges though, and so the Cyclopes were also said to be at work beneath the volcanoes found on earth. The Cyclopes did not just manufacture items for the gods though, and the three brothers were also said to have built the huge fortifications found at Mycenae and Tiryns. The Cyclopes were not immortal though, and there is indeed a story of the death of the Cyclopes in Greek mythology. Arges, Brontes and Steropes were struck down by the Olympian god Apollo; Apollo did this in retribution for the killing of his own son, Asclepius, by Zeus (Asclepius had been on the verge of curing death when he was killed). It was many years later, during the Age of Heroes, when a new generation of Cyclopes were recorded. These new Cyclopes were believed to be the children of Poseidon, rather than Ouranos and Gaia, and were believed to live upon the island of Sicily. This generation of Cyclopes were thought to have had the same physical characteristics as their predecessors, but without the metalworking skill, and thus were considered to be shepherds upon the Italian island. This generation of Cyclopes is famous for one Cyclops, Polyphemus, who appears in Homer’s odyssey, Virgil’s Aeneid, and also a few poems by Theocritus. Additionally though, the Cyclopes as a group, figure in the Dionysaica by Nonnus, who has the giants fighting alongside Dionysus against the Indians; named Cyclops include Elatreus, Euryalos, Halimedes and Trachios. Polyphemus is the most famous Cyclops from Greek mythology, and was encountered by Odysseus and his crew on their voyage home to Ithaca. Homer described Polyphemus as the son of Poseidon and the Nereid Thoosa, and Odysseus’ stop off upon Sicily would be unfortunate for the Greek hero; for Odysseus and 12 of his crew became trapped in the cave of the Cyclops. Polyphemus would have a states for flesh, and Odysseus and his crew were destined to be a feast for the Cyclops. 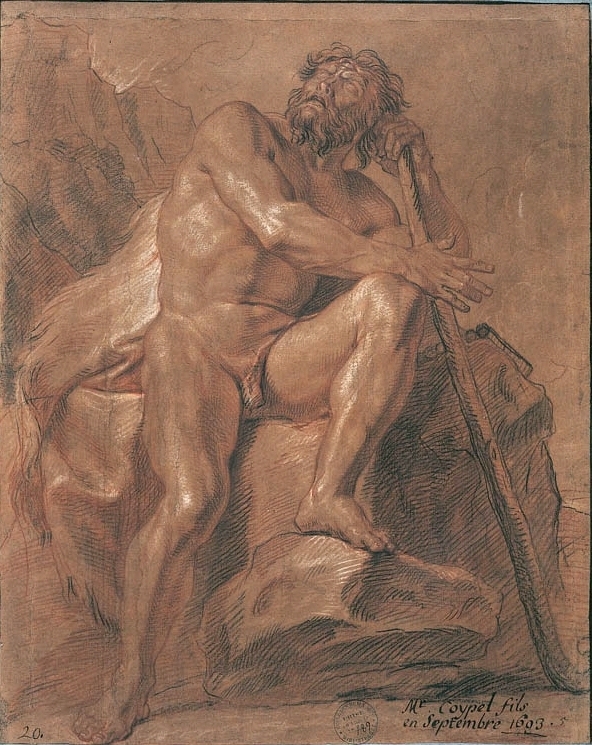 The clever Odysseus realised that killing Polyphemus would avail little for they would still be trapped inside the cave of the Cyclops, trapped behind a massive boulder. So instead, Odysseus blinds Polyphemus with a pointed spit, whilst the Cyclops is drink. The next morning Polyphemus has to let his flock out to graze, and as he did, Odysseus and his men escape by tying themselves to the underside of Polyphemus’ sheep. Odysseus reveals his true name to Polyphemus though as he escapes, and Polyphemus calls upon the vengeance of his father Poseidon upon Odysseus, and thus the sea god does much to delay the return of Odysseus to Ithaca. Polyphemus would also be encountered, also this time from afar, by another hero, this time Aeneas as he sought a new home for him and his followers. Aeneas would not linger upon the island of the Cyclopes, but the Trojan hero did manage to rescue Achaemenides, one of Odysseus’ original crew who had been left behind during the escape of the Greek hero. In these two famous tales Polyphemus comes across a cannibalistic brute although some poems in antiquity describe him as a lover. There is a love triangle between the Nereid Galatea, Acis and Polyphemus, and although Acis is often said to have been crushed to death by a boulder thrown by Polyphemus, some sources also tell of Polyphemus’ wooing of Galatea through poetry.